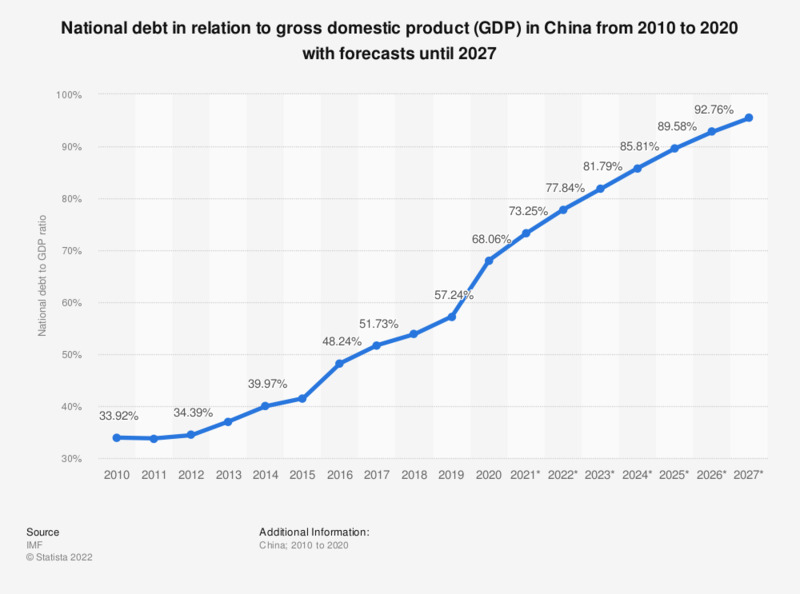 The graph shows national debt in China related to gross domestic product until 2017, with forecasts to 2023. In 2017, gross national debt ranged at 47.8 percent of the national gross domestic product. In economics, the ratio between a country’s government debt and its gross domestic product (GDP) is generally defined as the debt-to-GDP ratio. It is a useful indicator for investors to measure a country’s ability to fulfill future payments on its debts. A low debt-to-GDP ratio also suggests that an economy produces and sells a sufficient amount of goods and services to pay back those debts. Among the important industrial and emerging countries, Japan displayed one of the highest debt-to-GDP ratios. In 2017, the estimated national debt of Japan amounted to about 236 percent of its GDP, up from around 180 percent in 2004. One reason behind Japan’s high debt load lies in its low annual growth rate. China’s national debt related to GDP surged from around 18 percent in 2009 to 34 percent in 2010. After the 2008 financial crisis, China had relied heavily on credit financing to spur economic growth. The rapid increase in the debt-to-GDP ratio during that time had been mainly due to the four trillion yuan stimulus plan to invest in infrastructure projects.